MIF (Museum of Impossible Forms, Keinulaudankuja 4, Helsinki, 2nd floor. 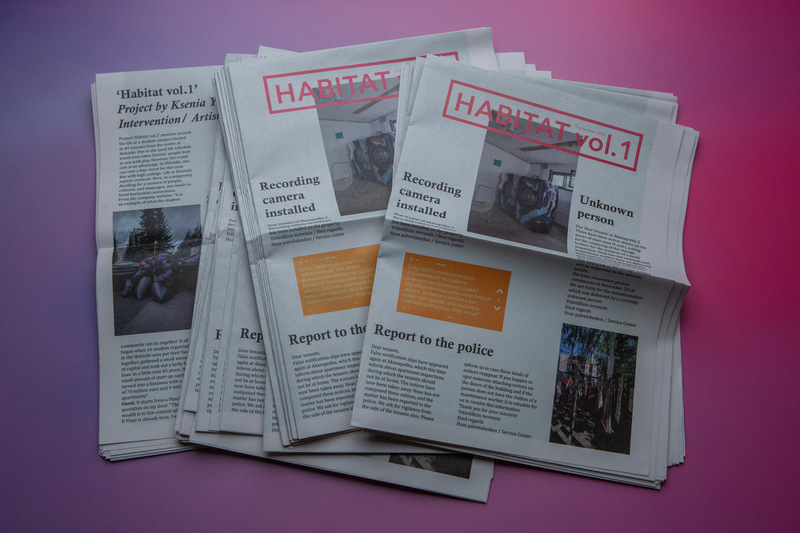 The project 'Habitat vol.1' revolves around the life of a student campus located in 40 minutes from the centre of Helsinki. Due to the local life schedule, travel time takes forever: people look at you with pity. However, the rental cost is an advantage. In Helsinki, one can rent a tiny closet for this sum. But with high ceilings. Life in Helsinki aspires verticals. Here, in a temporary dwelling for a mixture of people, cultures, and languages, one needs to build horizontal connections. From the company website: “it is an example of what the student community can do together. It all began when 16 student organisations in the Helsinki area put their heads together, gathered a small amount of capital and took out a hefty bank loan. In a little over 45 years, that small amount of start-up capital has turned into a business with a turnover of 70 million euro and 9 400 student apartments”. It starts from a Plato's quotation on my door: “The great wealth is to live content with little». If Plato is already here, I will recall Derrida (here and further) quoting him: “Back to places we think are familiar: in many of Plato's dialogues, it is often the Foreigner (Xenos) who questions. He carries and puts the question”. A landlord performs an act of hospitality and through legal procedure changes your status from a foreigner to a guest; here, they are called tenants. Tenants are generously let to share a transit space where the threshold between public and private stays uncertain. A connection between realms is called a 'master key' and is often used for random inspections. The language of a Master. “That is where the question of hospitality begins: must we ask the foreigner to understand us, to speak our language, in all the senses of this term, in all its possible extensions, before being able and so as to be able to welcome him into our country?” To be welcomed here, you need to follow the orders of the master obediently. Violations are meant to be reported. Sometimes this fragile equilibrium of worlds is tried to be violated by miserable attempts of neighbours crawling their fingers through the post slits and yelling for love in the silence of the night. To report a violation – use a Language of a Master. To relieve your dweller's tension in a social media - use a Language of a Master. Parasite. “Hospitality, reception, the welcome offered have to be submitted to a basic and limiting jurisdiction”. It is a common transgression of many outgoers – to leave a tiny piece of chaos after themselves, more like a symbolic gesture of liberation from a subordinate status of a guest. This ritual of transition is forgivable to an outgoer. Is it excusable to an artist? Ksenia Yurkova decided to enter communication with the community in a peculiar way. 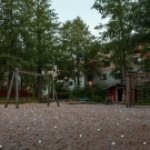 Making small installations using leftover of previous tenants, or reshaping common areas, even pranking a management company, she provoked discussions among the community members struggling with an unexpected and uninvited intrusion. Through interventions into spaces, through small transgressions questioning the guest status, then she pursued questions about vulnerable boundaries between notions of public and private, and conditions where hospitality turns into hostility. The result of the work will be presented in two parts: the artist talk at the territory of the student campus, where the artist will debunk her anonimity, and later the same day in the form of an exhibition at MIF (MUseum of Im[ossuble Forms). Ksenia Yurkova is an artist living between St.Petersburg and Helsinki. She works primarily with photography, video and text. The main focus of her interest is communication and language: the varieties of its substance, the possibility of conversion, its mythological aspect, stereotyping (the question of personal and political selfidentification and identification by others), problems of memory, attitudes, and reliance. 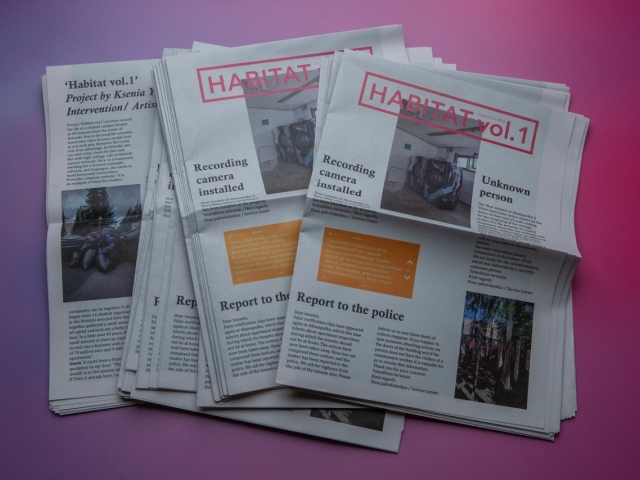 Coming a long way from political and cultural journalism, through organizing and curating cultural and art events, Ksenia settled in individual artistic and research practice, which allows the useful critical distance for observation and working with contemporary issues. Her approach is based on methods of language appropriation, over-affirmation, self-reflection and self-criticism through ironic component inevitably added to the most serious matters. Ksenia Yurkova has taken part in numerous shows and festivals worldwide, has released severalartist books. Her works are in private collections in Russia, France, Germany, and Finland. The Museum of Impossible Forms is a cultural centre located in Kontula, Helsinki. Formed by collective of artists and curators, the space has been operational since spring 2017. At its core, the space houses a multilingual library, a multimedia archive, and a a space for workshops, lectures and screenings. Museum of Impossible Forms means the collection of something that is non-collectible and ephemeral, such as community, participation and connection. With the primary concern on a curated discursive art program, the space acts as a platform or catalyst for critical dialogue, with program being a method of engagement. Staying true to the central narratives of being a collective seeking to unsettle preconceived notions of the other; the program reflects issues of decoloniality, postcolonial feminism, and queer thinking.